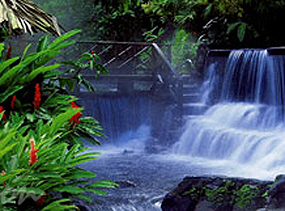 Hot Springs At Arenal Volcano Costa Rica - The perfect combination of volume, temperature and mineral content that is present in Tabacon Grand Spa Thermal Resort is unique in Costa Rica and worldwide. Lunch & Dinner at one of the best restaurants in the country. Enjoy the full spa for a massage, body wrap, brush scrub, manicure, pedicure, hot rocks and more. There are many naturally occurring hot springs around the world, many affiliated with volcanic activity. 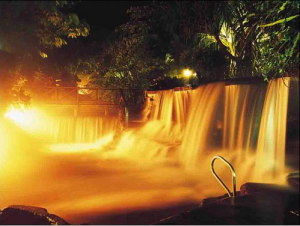 In Costa Rica, there are hot springs of different temperatures, flow volumes and mineral content that can be found in the regions around the Arenal, Irazu, Miravalles and Rincon de la Vieja Volcanos, and others in the Orosi Valley or near Ciudad Quesada. The best way to enjoy the hot springs! Arrive early, stay late! Spend the whole day with us, try all the pools, stroll the gardens, indulge in a great a-la-carte lunch and a succulent buffet dinner. You will have plenty of time to book spa treatments, and perhaps experience the Temazcal ritual. The Arenal Volcano, La Fortuna area has many first class hotels up to five star resorts. You may choose any of them on this list and we will be happy to make all the arrangements for accommodations, transportation, hot springs, spas and we pick up at all of these hotels for adventure activities. See The Hotels & Resorts HERE. ABOUT THIS TOUR: Lush, manicured gardens surround multiple pools ranging from cool to 104 degrees. Full showers and changing rooms for use. We recommend that you wear slip-proof footwear. Lockers and towels are available, but a fully refundable deposit is required. 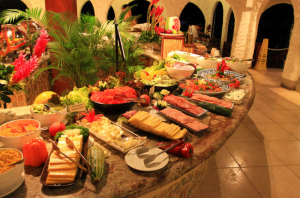 Meal include fresh fruit beverage and coffee. All other beverages available for purchase. Rates Valid until Dec 15, 2018 - 2019 Rates Will Probably Be The Same, But Ask Us. Sublimely beautiful Costa Rica has something for everyone. The treats range from exciting adventure to leisurely relaxation, and everything in between that we can add to any vacation package. Furthermore, tourists can sample the laid-back national lifestyle that ticos (the name the Costa Ricans call themselves) refer to as ‘Pura Vida’ – ‘pure life’: no stress, no hassle. All this, combined with unsurpassed natural beauty and a developed and accommodating tourist industry, makes Costa Rica a wonderful place to visit and vacation. Our agents can set up the all inclusive or al a carte vacation package and itinerary you want throughout the country. Our Reservation Office Is Located In La Fortuna, Costa Rica In The Shadow Of Arenal Volcano, behind the Catholic Church, Near The World Famous Hot Springs. IMPORTANT NOTE – Please be advised that every reasonable effort has been made to keep all prices up to date and free of errors or omissions. Prices and policies from our vendors and the Costa Rican government are subject to change without notice. Invoices will be issued at the time of booking to confirm all final rates and offers. LEARN TO SURF! Ever dreamed of standing up and riding a surf board on the Pacific Ocean of a beautiful tropical country? Well, if the answer is "yes" then this is your opportunity. 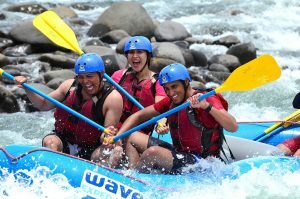 Be prepared for the an exciting time on this White Water Rafting and Tubing Combo, get wet and wild as you raft through rapids class III. In the second section of the river, we will change directions and continue our trip on Tubes! White Water Tubing gives you an adrenaline-packed experience with the freedom to tube wherever the river takes you! 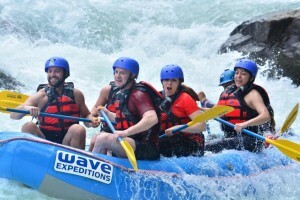 The trip route passes through thrilling Class I-II rapids on the Balsa River. Splash over ledges, bounce through drops, and ride some wild wave trains down the rapids in our specially designed tubes. LEARN MORE about this exhilarating adventure. LEARN WATERFALL RAPPELLING & CANYONING! Canyoning and waterfall rappelling is the original "Wet'n Wild" There is an age minimum of 5: The Canyoning Rappelling tour begins with a short 4×4 drive into the tropical rainforest outside the town of La Fortuna, in the shadow of the Arenal Volcano. After leaving base camp, it is just a short drive to the turn off and then the bumpy ride to the canyon begins (approx 20 min drive). You will trek through the forest on magical trails that lead to some of the most spectacular waterfalls in Costa Rica, a place few people get to experience. Along the way we will have the chance to discover the secrets that lie hidden deep within the canyon. LEARN ZIP LINING: With just a few minutes of training with our expert certified instructors you will flying safely over the tree tops, canyons, wildlife and rivers on a cable that will give you an exciting different perspective that you will remember forever. We have zip lines avauilable thriughout the country so no matter where your in-country travels take you, we will have a zip line available for you. Sublimely beautiful Costa Rica has something for everyone. The treats range from exciting adventure to leisurely relaxation, and everything in between that we can add to your vacation package. Furthermore, tourists can sample the laid-back national lifestyle that ticos (the name the Costa Ricans call themselves) refer to as ‘Pura Vida’ – ‘pure life’: no stress, no hassle. All this, combined with unsurpassed natural beauty and a developed and accommodating tourist industry, makes Costa Rica a wonderful place to visit and vacation. Our Reservation Office Is Located In La Fortuna, Costa Rica In The Shadow Of Arenal Volcano, behind the Catholic Church, Near The World Famous Hot Springs. Nothing to learn here - Just wade into the thermal waters under the waterfalls. Family Summer Vacation In Costa Rica and 10 best ways to enjoy. Costa Rica is a natural beauty: its coastline looks out on to two oceans with over 1250 miles of beaches which 780 miles are on the Pacific Ocean and between these oceans are 32 national parks, over 60 volcanoes, 15 wildlife refuges and hundreds of protected reserves but don't let all this information overwhelm you, Bill Beard's experts are here to help you get the vacation you have always dreamed about with no down time and the lowest possible price. However we do travel at your pace, just tell us what it is. Our office is in La Fortuna, Costa Rica, we are open 7 days a week and you will have our 24 hour contact number. For a small country – it's about the same size as West Virginia– Costa Rica crams in extraordinary biodiversity. Costa Rica accounts for only 0.03 percent of the earth's surface (has only 51.100km2). However it contains nearly 6 percent of the world's biodiversity. Its natural wealth, both in species and ecosystems, is partly explained by its geographical position. Bill Beard's packages and tours are ideal for first-time visitors who want to sample the country’s highlights without any fuss, taking in the Manuel Antonio National Park, which boasts gorgeous beaches as well as protected forests – home to sloths, pelicans, white-faced monkeys and anteaters – the dreamily beautiful Monteverde Cloud Forest, and the Arenal Volcano in La Fortuna, one of Costa Rica’s most picturesque. We can add easy hikes en route, a boat ride, and extra excursions including white water rafting, zip lining, waterfall rappelling, sailing, snorkeling, scuba diving, surfing, horse back riding. and MUCH MORE. The Nicoya Peninsula is on Costa Rica's Pacific coast. It comprises northern Guanacaste Province and southern Puntarenas Province. The area's surf beaches include Playa Santa Teresa and Playa Mal País in the south, and Playa Grande, in Las Baulas National Marine Park, in the north. Leatherback turtles nest and hatch at Playa Grande. Olive ridley turtles arrive farther south at Ostional National Wildlife Refuge. Nicoya is known as a "Blue Zone: We have obtained information from Nicoya, Costa Rica on ways to live longer and be happier. This information has been translated into lessons that can be implemented into your everyday life. Have a plan de vida. Successful centenarians have a strong sense of purpose. They feel needed and want to contribute to a greater good. Drink hard water. Nicoyan water has the country’s highest calcium content, perhaps explaining the lower rates of heart disease, as well as stronger bones and fewer hip fractures. Most travelers tick off a few dozen birds and butterflies, perhaps a mammal or two. But Bill Beard's birding tour is aimed at those who are serious about their binocular-usage and committed to full pro “twitcher” khaki get-up and to pre-dawn getting up, too. Taking in the tropical forests of the Carara National Park on the Pacific coast, the wetlands of the La Ensenada Wildlife Reserve and Monteverde, the guided group will expect to spot wonders such as the emerald toucanet, the long-tailed silky flycatcher and a vast array of hummingbirds, trogons, woodcreepers, manakins, tanagers and other species. The high point for many is a sighting of the resplendent quetzal, probably one of the most beautiful birds in the world. The resplendent quetzel, arguably the most beautiful bird in the world. The Tempisque Palo Verde River Wildlife Boat Tour will take you to the entrance of the Palo Verde National Park. The best bird watching for aquatic species is found right here, as the park is favored by many migratory birds as they escape the cold winters in North and South America. The area’s density gives it a rich mix of mammal, amphibian and reptile life, including many crocodiles, howler & white faced capuchin monkeys and scarlet macaws.The lowlands and marshes create the perfect conditions for the largest concentration of waterfowl and wadding birds in all of Central America. This is a bird watchers paradise as well as a perfect spot to see lots of crocodiles. After the scenic drive you will board motorized river canal boats and cruise the Tempisque River and the Palo Verde River where the two rivers converge. Experienced River Boat Guides will stop to get you close to animals, birds, and crocodiles.Watch as crocodiles slide in from the banks and glide through the water, see many varieties of birds, and look for monkeys, bats, and other wildlife.Costa Rica’s teeming biodiversity can leave even seasoned fans of flora & fauna feeling a bit dizzy. and one of the solutions for that is to visit the La Paz Waterfall Gardens – site of the world’s largest butterfly gardens, wildlife, trout pond, beautiful hiking trails, five waterfalls and the most beautiful and unusual accommodations, with spectacular views that you could possibly imagine. This is a highly accessible national park, and you can follow a paved road to the wheelchair accessible visitor's center near the top. The visitor center has information about the history of the volcano and current information about the geomorphic processes that shaped the ecological attraction. Other amenities include a cafe, restroom facilities, and a very informative museum. Walking just 15 minutes from the visitor's center, the main crater offers a spectacular view. At almost a mile (1.6 km) in diameter, the crater's rain-fed sulfuric pool still bubbles and emits smoke into the air. The last major eruption was in 1917 and that was the first one since 1910. visitors can still see geysers explode into the air up to 820 ft (250 m) high. Chances of getting wet are pretty remote as the crater descends almost 1,000 ft (300 m) and is one of the largest active volcanoes in the world. Standing on the rim, visitors often smell the sulfur in the air, which at times has proven to be acidic enough for the park to close. It is from this crater that the effects of acid rain can be seen on the vegetation surrounding the landscape. Around the huge main-crater is the beautifully blue-green colored Botos Lake (Laguna Botos) and on the opposite side, the von Frantzius cone. Sublimely beautiful Costa Rica has something for everyone. The treats range from exciting adventure to leisurely relaxation, and everything in between that we can add to your diving package. Furthermore, tourists can sample the laid-back national lifestyle that ticos (the name the Costa Ricans call themselves) refer to as ‘Pura Vida’ – ‘pure life’: no stress, no hassle. All this, combined with unsurpassed natural beauty and a developed and accommodating tourist industry, makes Costa Rica a wonderful place to visit and vacation. 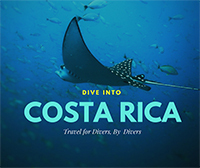 Costa Rica Dive, Surf & Rainforest Package. 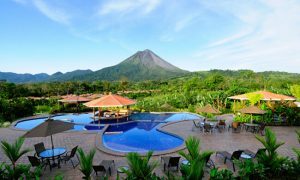 GREAT VALUE: 2 Dive Day / 2 ATV Surf Days Package with 5 Nt beach stay, 1 Nt rainforest/Arenal Volcano, 1 Nt San Jose. Entrance to Tabacon hot springs with buffet dinner and White Water Rafting Adventure with lunch and transport to San Jose included. FLY INTO DANIEL ODUBER (LIR) -- FLY OUT OF JUAN SANTA MARIA (SJO). Tamarindo Diria Beach Resort has the best location in the country if you want to both dive and surf. Located directly on Tamarindo's eclectic Pacific beach, just walk right into the waves and start surfing. Famous for surf schools and easily accessible waves, Tamarindo is a great place for surfers of all levels. Bring your board or rent one and surf before and after your dive days, then discover surf locations to the North and South of Tamarindo via ATV with a local surf guide. And as a bonus, divers will get to dive the famous Catalina Islands with a chance to see some interesting sites. You never know when you might see the herds of cow-nose rays, schools of mobula rays jumping out of the water like popcorn from a hot pan or the giant Pacific Manta Rays with wing-spans from 12-24 ft! Now that's exciting stuff! Some of the best waves right outside your doorstep when staying at Tamarindo Diria. So you can surf early morning before your dives and every afternoon when you return from diving -- just how cool is that?!!. But if you want to try a different set of waves, Langosta Beach is just a short distance from the town of Tamarindo. After your two dive days, you will spend two awesome days trekking to find gnarly waves to the North and South, and as though that wasn't enough, you will do it aboard ATVs guided by a local surfer who knows the waves. Pura Vida! 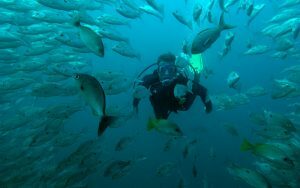 The Catalina Islands offer some of the best diving in Costa Rica and are famous for the tremendous amounts of marine life. Schooling fish on every dive site, white tip sharks, spotted eagle rays, southern sting rays and small critters like sea horses and harlequin clown shrimp. Add all that to the big stuff like whale sharks, manta rays, humpback whales, orcas, cow nose rays, pilot whales and you have world class diving and a life time of memories. Now that you have had fun at the beach, you can experience the beauty of the rainforest and the thrill of nature as you raft down the rapids of Costa Rica's Balsa River. Last night in the capital of Costa Rica -- San Jose. *If you fly into San Jose we can still arrange transfers, but it is almost four hours to resort, and there will be an additional expense. You should be checked out and ready to leave your hotel three and 1/2 hours before your scheduled flight. You won’t soon forget your guides or all of your wonderful experiences in Costa Rica. Pura Vida! Playa Tamarindo is an beautiful, elongated stretch of beach with waves perfect for beginners at both ends and those who want more action can still catch some fun rides. Playa Langosta, a neighboring beach, has unspoiled areas where you can call the beach your own. Surfers find patches where the waves are breaking best and you can easily spot them as you walk the beach. The hotel has a restaurant and bar, swimming pools, and much more. Check out more about Tamarindo Diria. This lively, eclectic beach is full of fun with lots of people watching, shops and restaurants walking distance. Only a 2 minute taxi ride from the quaint beach town of Playa Langosta where you a different set of waves and secluded sections of beach. If You Are Not Certified? We can certify you to dive while you are on your vacation here. 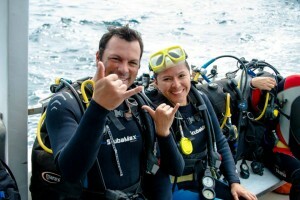 We also offer advanced classes, rescue and dive-master in Costa Rica. If you are taking a certification course, please bring MEDICAL STATEMENT signed by your physician if you have any conditions that could preclude you from participation in Scuba Diving. If you are doing a Referral Certification course to complete a course you started at another dive shop before coming to Costa Rica, please bring all of the REFERRAL PAPERWORK you were given by your instructor as well as you MEDICAL STATEMENT. We also book live aboards to Cocos Islands and offer pre & post trip mainland adventure tours that may be added to your itinerary. We will be at DEMA in Las Vegas November 14 – 17 in booth # 2521, Please stop by and say hello. If you would like to have a sit down with us just send us an e mail agent@billbeardcostarica.com and we’ll set it up. We have a very informative seminar with Vanessa, Nadine & Bill with a 23 minute video presentation followed by Q & A’s at 11 am on Friday Nov. 16th in room N-240 with lots of door prizes, Costa Rican coffee and a mini vacation for two. Great opportunity to find out all about Costa Rica with the experts. Book NOW and SAVE! Choose from 2 great packages for groups with hotel options for all budgets. Because of its compact geography, everyone in Costa Rica is presented with a cornucopia of choices. The biggest challenge in Costa Rica is trying to decide which combination is best for your vacation. This is where Bill Beard’s Costa Rica Adventure Travel comes in. We have been in Costa Rica since 1970 and know the country well enabling us to provide our clients with the best that Costa Rica has to offer. Our goal is to help you share in the wonders of nature and enjoy every minute of your vacation. Our commitment to quality and personalized service is unsurpassed. All of our Bill Beard’s Choice Tour packages are privately escorted in a modern, air-conditioned vehicle by one of our English speaking, Costa Rican naturalist guides traveling at your pace. We also offer non-private tours for vacations that are affordable for all budgets. Invariably, when we ask our clients what one thing stands out most about their vacation, the reply is “the guide.” Guides take the hassle out of travel. They provide education, insight into the host culture, and in many cases a lifetime friendship. 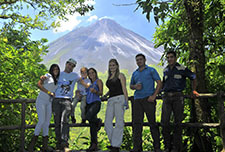 Our Costa Rican staff all have many years experience in the industry. Our association includes the best hotels, resorts and restaurants available. We have Costa Rica’s most knowledgeable, experienced operators, instructors and guides with proven track records providing you with the safest and best vacation possible. However, if you are on a budget, we also offer non-privately escorted tours where you combine with a variety of other customers and travel at a predetermined pace. We can adapt any package for self-drive if you prefer the freedom of having a car available for further exploration. It’s the attention to detail that defines us. Thank you for choosing us to be a part of your memorable vacation to Costa Rica.